This extract is from the Northern Advocate 6 May 1915 – almost a hundred years ago. “The whaling season, representing a period of considerable activity in the Bay of Islands…opens this month and extends to October. The opening of the season is in no way regulated by the Government, as are the game and oyster seasons, but by the fact that from May to October is the time in which whales frequent these waters to rear their young. 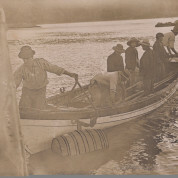 The photo shows the Whangamumu whale net being set. In 1915 70 humpbacks were caught at Whangamumu. They yielded 250 tons of oil, 70 tons of bonedust for a total value of £4350.